This is a sponsored post written by me on behalf of Huggies® because “Kids Outgrow Diapers, Not Messes™”. As always, all opinions are my own. 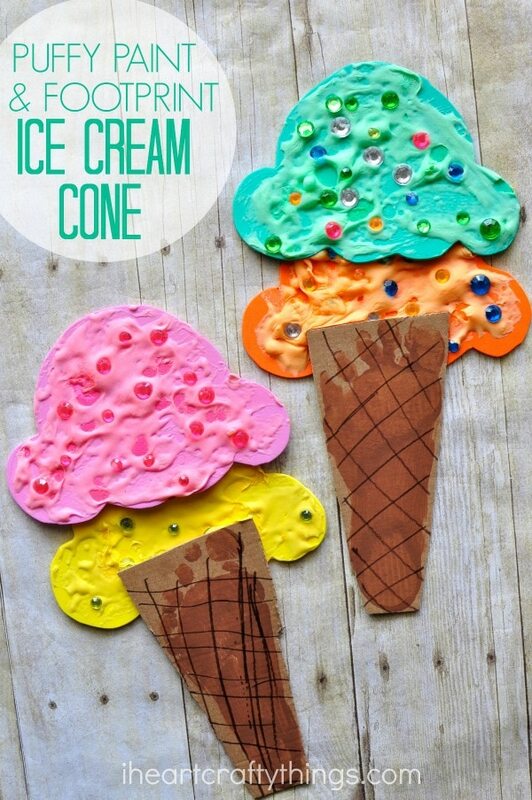 We hope you enjoy celebrating National Ice Cream Month with your kids by making this Ice Cream Cone Craft. Did you know July is National Ice Cream Month? That means we can eat a double scoop of ice cream every single day and not feel guilty about it right?… Don’t we all wish! If you are looking for a fun way to celebrate ice cream this month with your kids that doesn’t involve packing on the calories, boy do I have a treat for you today! 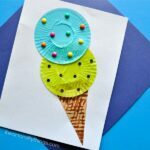 This ice cream cone craft screams summer time fun and the footprint cone makes this craft a perfect keepsake to help you remember the summertime joys of having little ones. Go grab your supplies and some Huggies® Wipes and get ready to embrace the messy side of crafting! 1. Start by cutting out a rectangle piece of cardboard a little bigger than your child’s foot. Use a paintbrush to paint the bottom of your child’s foot with brown paint. Make sure to have your Huggies® Wipes on hand because they are going to be lifesaver for cleanup. 2. 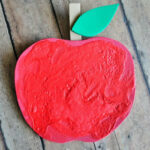 Have your child place their painted foot onto the cardboard, pressing down to make sure their entire foot gets printed. 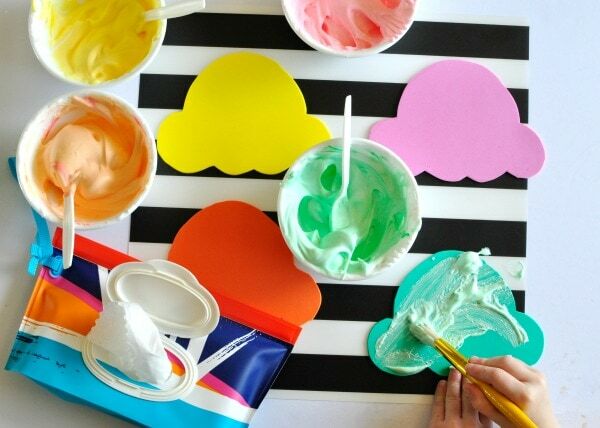 Lift their foot off the cardboard and immediately grab those wipes to wipe the remaining paint off of your child’s foot. Set the footprint aside to dry completely. 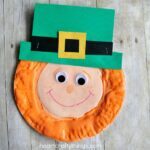 I used to be scared of hand and footprint painted crafts because of the fear of my kids touching everything in sight on their way to the sink to wash. Discovering the joy of using Huggies® Wipes while crafting has been life changing. They have triple layers and are really thick so they easily tackle crafty messes like getting paint off of your hands, feet and face. They are also soft and gentle on the skin so I don’t worry about my children using them, unlike other types of cleaning wipes. 3. 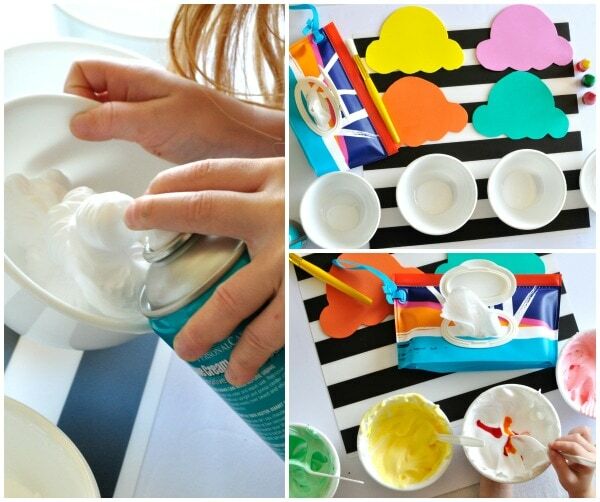 Cut ice cream scoop shapes out of your foam sheets. We went with two scoops per ice cream cone. I mean, we are celebrating ice cream and who doesn’t love double scoops, right?! 4. 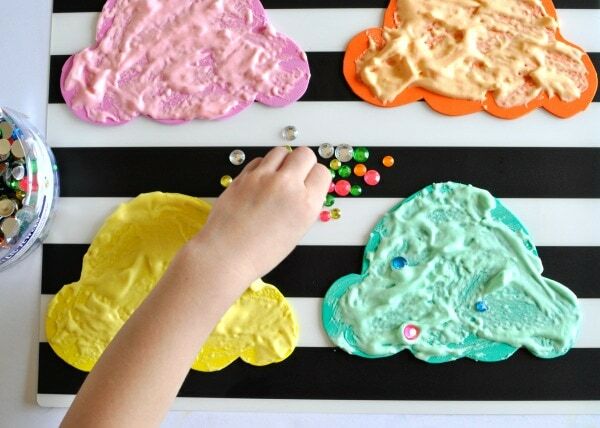 Now mix together your puffy paint. The recipes I have seen to make puffy paint call for mixing together equal amounts of school glue and shaving cream. I prefer to have more shaving cream though so you might want to play around with it a bit to see how you like it. To make ours, I added about a tablespoon of glue into the bottom of our mixing bowls. Then we sprayed some shaving cream on top and mixed them together. Add a few drops of food coloring into your bowl and mix. Now your puffy paint is ready. 5. 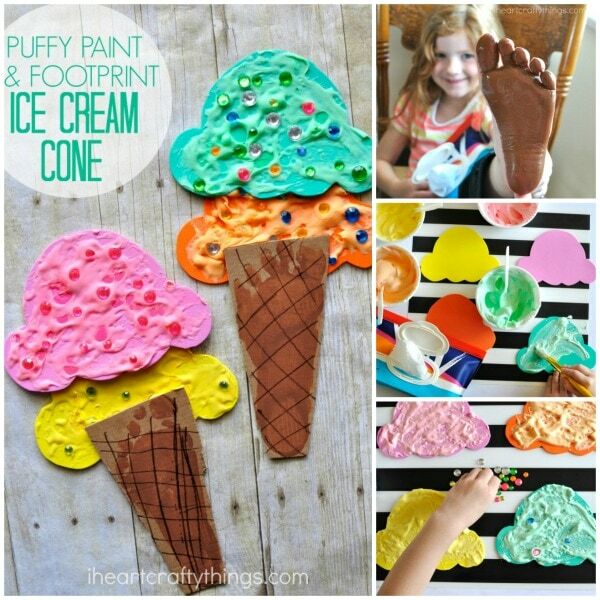 Use your puffy paint to paint your ice cream. 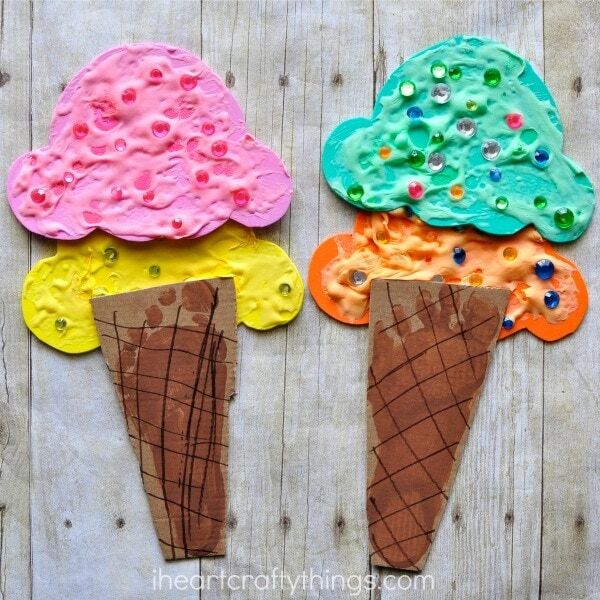 We went with coordinating colors but feel free to be as creative and wild as you want with your ice cream flavors. 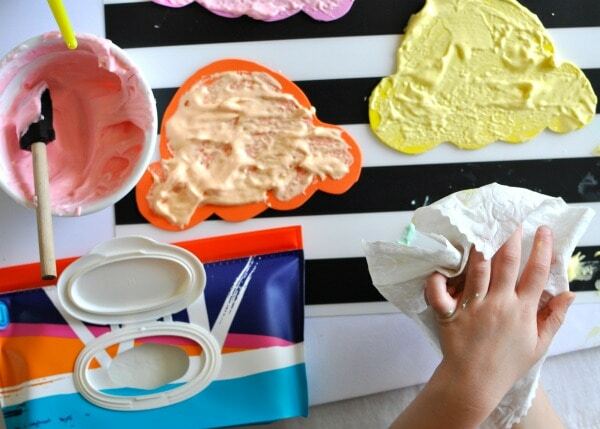 Puffy paint can sometimes be a little messy so make sure to keep your wipes out, open and ready to tackle messy hands or spills on your surface. We used our Huggies® Clutch ‘N’ Clean Pack which comes in a variety of stylish designs and you can refill the pack when it is empty. Not only do I keep a pack in my craft closet but I also have some in my car for when we are on the go. Huggies® Wipes come in an assortment of fun and convenient sized packages the whole family will love. 6. While your puffy paint is still wet, place acrylic craft jewels all over your ice cream scoops to make bright and colorful sprinkles on your ice cream. Your ice cream scoops will take a few hours to dry. 8. Last but certainly not least, grab a few more Huggies® Wipes so the kids can clean up! They look so bright and colorful, just like summer time! Does your family love to embrace messy activities? Join the Huggies® #HugTheMessSweepstakes by tagging your messy kid photos on Instagram and Twitter for a chance to win $2,500. We would love to see some messy ice cream entries! I pretty much love everything about ice cream. It’s ooey, gooey-ness and yummy sweetness. I always go for the traditional flavors like rocky road or vanilla but my kids are sure to pick the brightest, boldest colors they can find like bubble gum or cotton candy. I love that about them! What is your favorite flavor of ice cream? Visit Huggies® to purchase wipes for your craft supplies, or find them at your local store (not just in the baby aisle). Make sure to stay connected by following Huggies® on Facebook, Instagram and Twitter.